Back by popular demand, the Sig Sauer P225A shares the same slim, comfortable single stack grip as the original P225, but features enhancements such as classic wood grips, short reset trigger and Siglite night sights. 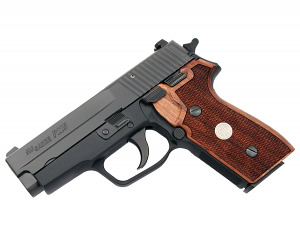 The perfect do-it-all sized gun, the P225A covers all the bases. Comes with two new style P225A magazines, manual, lock, and case.